Vizag steel recruitment 2017 for Management Trainee-Technical through GATE 2018.The detailed eligibility and application process are given in below. METALLURGY / MECHANICAL / ELECTRICAL from a University/ Institute recognized by AICTE with minimum 60% of marks in the aggregate of all years / semesters (50% in aggregate for SC/ST/PWD candidates). Should have qualified in GATE-2018 examination. The selection process will consist of Group Discussion / Interview. Eligible candidates should have qualified in Graduate Aptitude Test in Engineering (GATE)-2018, which was held during the month of February 2018. Candidates shortlisted on the basis of their performance in GATE-2018 will be intimated to appear for Group Discussion / Interview (which may be held at short notice). Candidates should visit the RINL website from time to time for information on the same. 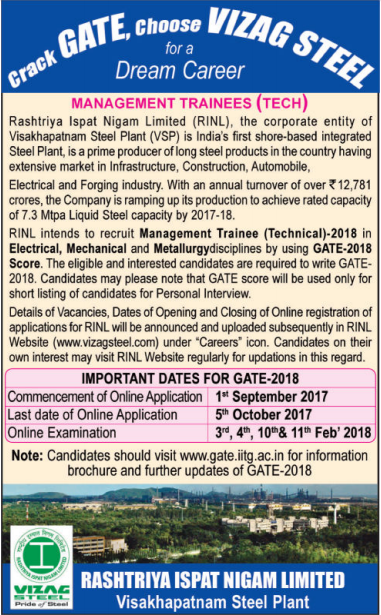 Note: Details of Vacancies, Dates of Opening and Closing of Online registration of applications for RINL will be announced and uploaded subsequently in RINL website(www.vizagsteel.com) under “Careers” icon. How to apply Vizag Steel Recruitment 2017? All interested and eligible candidates can apply for this positions in online from 17 July 2017 to 31 July 2017.